Balsa wood blank, Volan glass (? 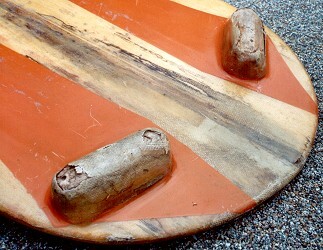 ), fiberglass fin, balsa wood hand grips.. Handles : 5'' x 1 1/2'' x 2'' high. 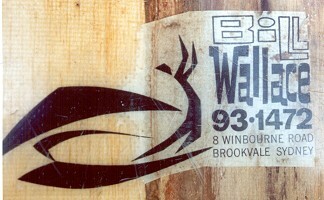 BILL WALLACE 931472 8 WINBOURNE ROAD BROOKVALE SYDNEY. Deck: Clear with twin tapered orange panels. Bottom: Clear with twin tapered orange stripes..